Character TBC, but very excited to be coming along. All caught up on the content! Would love to join in but I won’t have gotten the new content out of the way before joining in, got a fair bit of catching up to do. @Hawking, how far back are you? Can you blitz the remaining story content before the 17th? I’m not even back in the country until the 16th, sadly, and I’ll be needing to update the game and so on. Would love to join in but I won’t have gotten the new content out of the way before joining in, got a fair bit of catching up to do. I’ll be around for the debrief and fallout, if that carries on into jedi night or whatever else follows! Regrettably I must withdraw due to clashing work commitments, the demons in upper management have decreed that my attendance to their slave factory is compulsory on pain of death. Hope it's a good time, very keen to RP the fallout! This has been on my mind, too, given all of Aspasia's various strife-filled episodes and lived experiences. Echoing what Bling, Niarra and Wymarc have said said, I find the intersection between Jedi philosophy and Jedi science to be the best bit of this discussion. To what extent is the disease treated as a medical issue when it has the potential to fundamentally affect the mental and psychic faculties that are necessary to Jedi-ing? Could the Jedi use their tele-empathetic abilities and advanced understanding of medical science to treat the physiological and biological elements of the afflictions? Could the Force be somehow used to manage serotonin and dopamine in the way that we do in the real world with medication? More importantly, would they? Or would a therapeutic approach be more in line with Jedi spirituality, given that overcoming emotional adversity and enduring trauma is a part of the Jedi path? The Jedi do practice healing through the Force when they could theoretically just use standard 'mortal' medicine for physical injury, would that change when the brain and by extension mind are threatened or injured, when so much of the Force is construed mentally? In a weird way it's a philosophical argument that would be more pronounced in the setting than in real life, although there are similar debates in discussions regarding the ability of people to serve in the armed forces or policing with mental illness. They're debilitating things to live with for we mere earthling mortals, let alone for space wizards who have a sworn (and potentially rather stressful) duty to defend all life, and who throw things around with their minds. If that wasn't enough, they have stringent beliefs about the management of emotion and behaviour, two things which can be fundamentally and dramatically affected by mental illness. It opens up a can of worms that is certainly pushing the limits of the setting, but surely symptoms such as mood swings would present a serious threat to a Jedi's capacity to Jedi. If Star Wars were a hard sci-fi piece rooted in realism, maybe we'd see Jedi falling to the dark side simply due to struggles with mental illness. That's a hard thing to convey without being trite and potentially dismissive of serious real world issues, and probably why things that may realistically result in legitimate psychological damage in the setting often manifest themselves more as ambiguous emotional responses of 'deep sorrow', 'spiritual exhaustion', and so on. They're expressed as less direct, symbolic representations to get the same feeling across. This is probably why you also get more holistic approaches to healing these things in the fiction, by way of undertaking spiritual journeys or confronting the source of the trauma in a fantastical (or not) way. Same goes for expressly medical problems; this is space magic, waving your hands without delving too deeply into the science is a legitimate and even preferable way of mending flesh. For our purposes, the Force is an excellent narrative device for this reason; it's all about the intersection between the will, behaviour and feelings of the individual and the giant energy thing which lets you perform superhuman feats, including healing, provided you play by its rules and work within its limitations. Went wildly off topic here, but, I'll surmise by referring to how the Legend of Korra dealt with this issue, with some spoilers from Book 4. Spiritual damage and psychological damage are treated as roughly equivalent. The magic water can fix the body, but healing the mind to an extent where the injured person can fulfill their responsibilities and make use of their abilities is a journey and a battle requiring dedication and some suffering. Side note: does make you wonder how this sort of thing would be dealt with by the Sith, if dealt with at all? Separate thread, maybe. Echoing what bling said regarding how it would be LIKELY treated; nothing invasive. Using the Force in limited magnitude to guide recovery over time, fiddling with the biology where absolutely necessary. Oddly, a bit like we do in the real world, permitting a swap of the Force for technology and medicine. Maybe there aren't any better answers in space for this? Guild Recruiting / Re: Rp guilds? It so happens that one of the more active guilds you'll find on here is the Jedi Custodum (lots of info to be found here: http://begerencolony.org/index.php?action=sgroups;sa=view;gid=2), headed by @Dassalya, and of which I'm an officer alongside @blingdenston and @Wymarc! 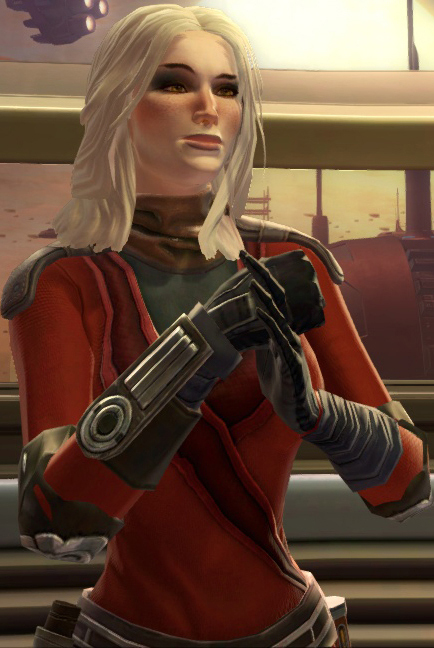 JC's long been one of the stalwarts of the community, been around for 5 or 6 years now as the Jedi guild. We host a Jedi Night event every Thursday, usually at our stronghold but occasionally elsewhere. If you're keen on checking us out, feel free to pop along, or get in contact with one of the above people! G'day Tenno, welcome to the forums! This whole place is dedicated to the RP guilds on Satele Shan which have shimmied over from the Begeren Colony server. If you have a look up top, the Guildnet feature lists most of them, although not all of them are active. What sort of RP are you looking for? Remains my biggest gripe with Rebels. The anthology style worked for the Clone Wars due to the setting, but it did the whole multi-episode arch thing. Rebels really should have been a linear story, in the style of Avatar. From what I can tell? Yeah, kinda. It's what makes the shows feel real kids-y to me. I mean, it's meant to be a kids show, but so is Justice League Animated and that doesn't stop it from having buildup and dramatic tension. Just wanted to give a quick shout out for your ongoing story with Merrant and Asori. Never thought I'd see either of them in a political/crime thriller in space, but, it's made for some enthralling reading.